Sneak Peaks and Giveaway !!! Next Thursday Pink by Design will be releasing some more AWESOME stamps !!!! Here is a sneak peak of two of them (but I cant tell what they are...hehhehe) !! I also used my NEW E2 !! The bunny is from the preloaded cart Just a note and the tag from the preloaded cart Cricut Essentials. I'm LOVING the new E2 !!! So I said giveaway right??? Well I will be giving away the Rounded Argyle background stamp from Pink by Design. How awesome is that? All you need to do is follow me and leave me a comment to win ! Pink by Design Stamps with my new Imagine cart !! I was sooo excited to see a cartridge finally have a milk carton cut on it ! The Imagine cart "All Wrapped Up"!! 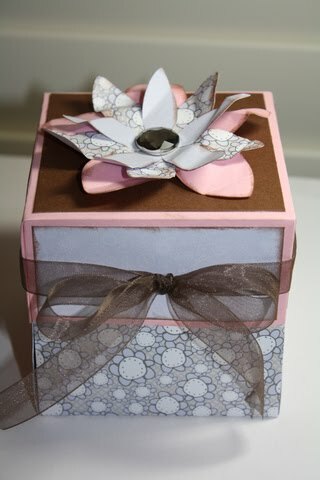 It's all about Mom's on Pink by Design today so I created a gift box using 3 different stamps !!! First I used the "Leopard" print background stamp in pink and brown, then the "Tiny Dots" background stamp for the tag and "Feelin Groovy" sentiment set for the Foxy Mama !! I also embellished with rhinestone and gorgeous PBD crinkle ribbon ! Don't forget to see what the rest of the design team came up with at Pink Cricut !! Winner of Blog hop !! Thank you all for visiting my site for Gabys blog hop! Also welcome to all my new followers !! The blog candy winner chosen by random org is..... # 49 !!! That is a beautiful card. Love all the embellishments! Thanks so much and congrats !!! Please email me at michelle at scrappinwithmybug.com !! Earth Day / Birthday Hop ! Happy Earth Day !! and Happy Birthday to Gaby!! Thanks so much to her for asking me to participate. I created an garden inspired easel card. I tried a new technique ripping the paper and I like how it turned out. It says "Grow where you are planted"
I used various materials including Pink by Design crinkle ribbon, Martha Stewart starburst punch, stamps from Joanns, glitter brads, an patterned paper from DCWV playtime stack. Someone say BLOG CANDY?? Please become a follower and leave me a comment for a chance to win a handmade vinyl Cricut bug for your car or machine your choice of color and style. Thanks so much for stopping by! The next blog on the hop is Ruthie's super cute blog ! and then a picture of theres. They did an AWESOME job !!! These are a few of the Easter treats I have been making for my daughters class. My daughter is 5 and wanted to help, so she colored the eyes, tongue and did some of the cheeks I think she did a great job! I used Doodlecharms, Pink by design "tags and treats" sentiment stamps and a Peachy Keen Wide Eyed and Bushy Tailed face stamp. Congrats Tami and thanks for being a new follower !!!!!!!!!! Im soo excited Kimi asked me to be a part of her Birthday blog hop !!! So if your arriving from Tanyas blog then your in the right place !!! 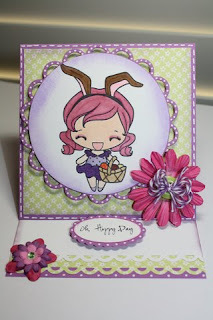 I created a fun easel card for the birthday girl using a greeting farm stamp and a pink by design stamp! Your next stop on the hop is Lauras blog !!! If you get lost heres the line up !!! Michelle - http://www.scrappinwithmybug.com/ YOU ARE HERE !!! Its design team day over at Pink by Design ! I wanted to share an Easel card I made with the Hoppy Easter set. 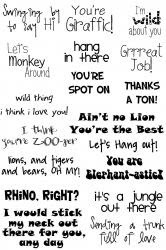 This set has too many cute sayings on it !! 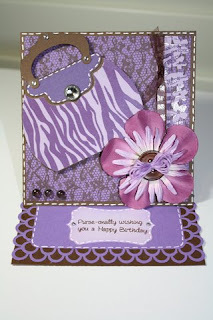 I also used a Greeting Farm stamp, Purple twine, spellbinders, various punches and embellishments! This month in class we will be learning and making this Explosion Box! If you live in Northern California the class is this Sat. April 16th. If you would like the online class. I will include most materials, Written instructions and a private you tube link on how to assemble the project. The kit is $15 plus $3 shipping (within the 48 states). Again thank you sooo much for helping me win the refferal contest !!! The winner was chosen by random org, for the pink by design new stamp set! Michelle~ you are so sweet for sharing your winnings! I am so lucky to live near you and get hands on card making and scrapping techniques! I love it! Thank you! Thank You Facebook Fans !!! 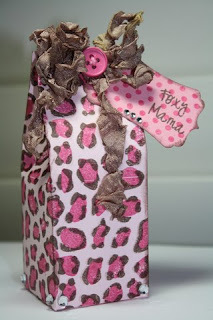 Last month Pink by Design had a contest and many of you went to their facebook site and said I had referred you! I'm excited to say I won for the most referrals!!! As a thank You I spent part of my gift certificate and purchased one of her brand new sets to give to one of you! To be eligible to win please leave me a comment on this post by Sunday night (4-10) Today is also a special day because I'm a guest designer over at Funky Cards! Madison is turning sweet 16 !!! So this is a special easel card I created and sent her. 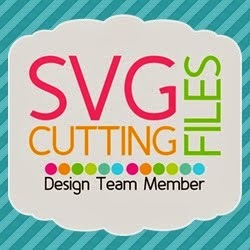 Today I'm a guest designer for my friend Jenny at Crazy about Cricut! Her birthday was the other day so in celebration of that I made her a card with her 2 favorite things: the color red and halloween. 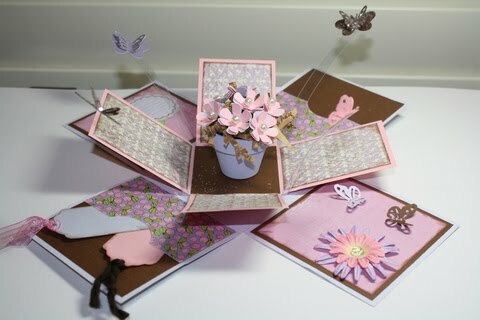 I used the new DCWV Lemon Flower stack, Greeting Farm stamps for the girl and a Pink by Design stamp for the sentiment. Please be sure to stop by and wish Jenny a Happy Birthday !!! New stamp sets tonight ! So this is the night Pink by Design releases new stamp sets! Our project was to make a tag, with a new background and one of the new sentiment sets! 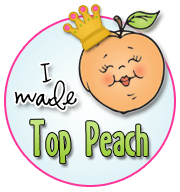 For the cut I used the circle exclusive "Cricut Everyday" cartridge. Hope you enjoy! and dont forget to join us for the live U-Stream tonight!! !